With so many models to choose from, there's a member of the 2017 Nissan NV Series for whatever you're selling. If your product happens to be transportation, check out the 2017 Nissan NV Passenger. Inside, there's plenty of space for up to 12 passengers with versatile seating, giving you the ability to reshape the cabin to suit your company's needs. Passengers will love the NV's modern convenience--power outlets can be found throughout the cabin, allowing passengers to keep devices charged during long trips. The 2017 Nissan Cargo provides a wide range of configurations to suit a variety of businesses. You can choose between two roof heights and three weight ratings for the model that gives you the space you need to organize your equipment and cargo items. The high-roof model offers an incredible 487 cubic feet of cargo space, which should be more than enough space for your construction equipment or specialty plumbing tools. If you need to move a trailer full of supplies, that's no problem for the NV Cargo, which tows up to 9,500 pounds. If you're operating your business in a busy urban area, the 2017 Nissan NV200 a compact commercial van that strikes the just-right balance between agility and a sizeable cargo hold. The bed offers 122.7 cubic feet of maximum cargo space - more than enough for many city-based delivery services. You can stack up your catering goodies or flower bouquets and get them to their destinations in a snappy fashion, because the NV200 supplies sharp steering, city-friendly handling, and peppy acceleration. The NV200 Taxi rounds out the 2017 Nissan NV Series. Like the original NV200, it's specially designed to strike the balance between interior space and street-smart mobility. The wide backseat supports up to three patrons, with elbowroom to spare. Pop one in the front passenger seat and you can transport groups of four across town in impressive comfort. Up front, taxi drivers can take advantage of the built-in navigation system to keep an eye on traffic flow. 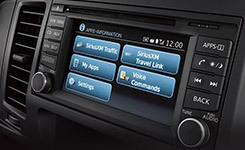 The intercom makes it easy to communicate with passengers through the cabin divider. When you need a heavy-duty hauler, there's no better option than the 2017 Nissan NV 3500. Its V8 engine packs enough punch to move nearly 4,500 pounds without making a fuss. It's perfect for construction businesses and their heavy supplies. Should you run out of cabin space, the NV 3500 also gives you the ability to tow up to 9,500 pounds, which represents quite a few extra supply pallets. The NV200 is specially designed to tackle busy urban areas with ease. 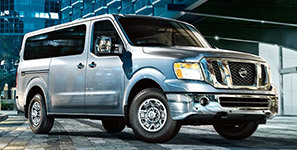 In the NV Passenger, there's space for up to 12 people and all of their personal items. The NV Cargo's fork-lift-friendly doors make for an easy day at work. Staying connected with drivers has benefits for your bottom line. In short, there's a 2017 Nissan NV Series model for every kind of business. If your job is to transport passengers around town, the 2017 Nissan NV Passenger has plenty of space for everyone. The 2017 Nissan NV Cargo is perfect for electricians and plumbers, because upfitting options give you the ability to organize and transport everything you need to get the job done. Finally, there's the 2017 Nissan NV200, which is the perfect pick for urban-based delivery services, with the compact body that's necessary to make your way through busy city grids.